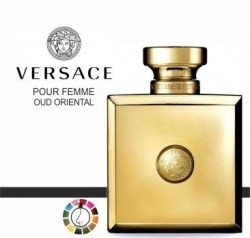 Fragrance Versace Oud Oriental perfume for Women by Versace was introduced in 2013. Versace Versace Oud Oriental is classified as Oriental Woody fragrance. Scent notes of Versace Oud Oriental Versace include top notes of freesia, rose, saffron, middle notes of heliotropium, violet, patchouli and base notes of leather, vanilla, oud, sandalwood.